A remote island off the Maine coast holds a family's silences that reverberate through four generations. A life-or-death decision will carry devastating consequences for one mother while haunting another forever. A reckoning with one's personal history and of those we love. In The Guest Book, Sarah Blake brilliantly connects each of these distinct touchstones through a sweeping and unforgettable multigenerational family saga that begins in 1935 with Kitty and Ogden Milton. The young couple seemingly has everything--a loving marriage, three beautiful children and a privileged lifestyle befitting Ogden's status at the helm of Milton Higginson, a prestigious New York investment banking firm. But when their charmed life shatters, Kitty's grief prompts Ogden to purchase Crockett's Island, an idyllic patch of land off the coast of Maine, to "make her happy." The island and its "Big House" become the Miltons' summer home for four generations, hosting the family and their guests for seasons of picnicking and sailing, square dances in the barn, lobsters delivered daily and cocktails served on the dock. Everything about the island--the annual traditions, the decor in the sprawling house, the family members' rigid mindsets--remains anchored in a bygone time. The island holds the family's happiest memories alongside their darkest secrets, deepest regrets and devastating silences. With relatable characters, an absorbing plot and even a touch of mystery, Blake easily draws her reader into the Miltons' world. She is a master at showing how one person's decisions--the large and the seemingly insignificant alike--hold the power to shape both an individual's and a family's history while echoing down throughout generations. "Every life [has] at its center a beginning that was not birth," Blake writes, "a moment when the catch on the lock in one's life opens, and out it comes, starting forward." Blake sets this theme immediately with her choice of two epigraphs for The Guest Book. James Baldwin's quote from his 1953 essay "Stranger in the Village" about how "people are trapped in history and history is trapped in them" and a quote from Virginia Woolf's Between the Acts--"surely it was time someone invented a new plot"--both serve as The Guest Book's literary touchstones. A pivotal incident in the Milton family occurs in 1959 when Len Levy, who is Jewish, is hired to work at the WASPish Milton Higginson. Bright and ambitious, Len falls in love with Ogden's sister, Joan, who reciprocates his feelings while knowing they need to keep their relationship secret. When Len is invited to Crockett's, he naively brings along his best friend Reg, an African American man. A contemporary of James Baldwin's, Reg helps Len understand that nobody who is considered "different"--much less a Jew or a black man--will ever be fully welcomed in the Miltons' world or be considered their equals. Even more shocking is that this experience isn't the first time someone in the Milton family has been challenged to make a life-defining choice influenced by prejudice. More than 75 years later, Evie Milton, Kitty and Ogden's granddaughter, is fighting with her cousins over selling the island. Evie realizes her desire to keep Crockett's represents more than childhood nostalgia and is somehow connected to her recurring dreams of her mother, Joan, who wished to be buried on Crockett's with a nondescript, unidentified marker simply stating "Here." To try and understand her mother's odd request, Evie returns to Crockett's for what may be her final visit--just as her husband's academic research uncovers disturbing revelations about the Milton family's past, particularly the financial investments Evie's grandfather Ogden made in Germany during Hitler's rise to power. Through Evie, a professor with expertise in medievalism and women's lives, Blake challenges her readers to confront the prejudices and silences that remain embedded in our individual and collective histories. Similarly, Evie tells her students that history is made every day by ordinary people: "Wars, plagues, names upon tombs tell us only what happened. But history lies in the cracks between.... History is sometimes made by heroes, but it is always made by us. We, the people, who stumble around, who block or help the hero out of loyalty, stubbornness, faith or fear. Those who wall up--and those who break through walls. The people at the edge of the photographs. The people watching--the crowd. You." 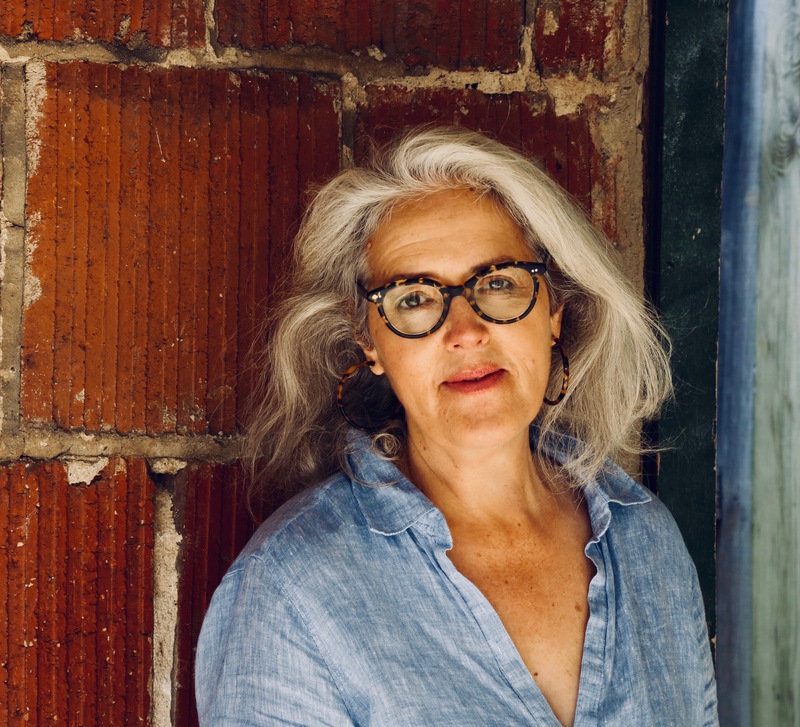 Sarah Blake is the author of two previous novels, Grange House and the international bestseller The Postmistress; a chapbook of poems, Full Turn; and Runaway Girls, an artist book in collaboration with Robin Kahn. 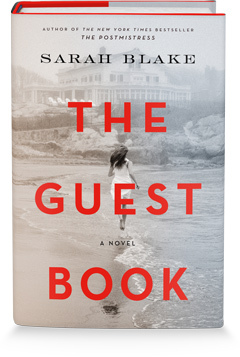 Her new novel, The Guest Book, will be published by Flatiron Books on May 7, 2019. Blake lives in Washington, D.C. with her husband, the poet Joshua Weiner, and their two sons. Let's start with the setting. I was curious about whether Crockett's Island was an actual place. When I searched Google, I discovered a Crockett's Cove in Maine. Is the island based on somewhere you know or have visited? Yes! It is definitely inspired by an island I grew up going to, one that my grandparents bought in 1936. The way in which Kitty and Ogden come upon Crockett's is similar to my family's story, and the real Crockett's Cove is a place I know very, very well. That said, I feel the need to mention that what happens to the Miltons in The Guest Book is a completely fictional departure from my family's story. However, I certainly feel like our island was the genesis for me as a fiction writer. Well, like the Milton family's retreat, ours was a place where all kinds of "family quiet"--or the silences, if you will--were active. In many ways, The Guest Book was born from my own questions. What does it mean to have an island? It grounds my own place in the social realm by setting me as very much someone who is white, old-moneyed, who has privileges others do not. The Guest Book explores race, religion and social class in a way that feels new, like the reader is being invited to get closer to issues that are often uncomfortable. When I started this novel in 2010 I really wanted to explore and interrogate my own place in the structure of this country, both in terms of race and class. I felt ready to examine who I was within the larger conversation. As you remember, in 2010 Barack Obama was president and, with his election, the conversation about race in the U.S. seemed to have kicked up to the surface in a way that was so exciting and liberating for me. So the question becomes: How do we talk about the past? How do you put race forward? How are we talking? Why is it important that we learn how to have those difficult conversations? After all, it is easier to sweep things under the proverbial rug, to pretend our reality isn't what it is. Because there are such repercussions of not having those conversations and they echo for generations through our silence. That impacts who we are. There is also the need to know and understand one's own personal history within the context of the world's history and to make sense of the present, too. Now more than ever. Your protagonist Evie, a history professor, challenges her students to think deeply on that idea. Right. Who would you have been, back then? What would you have said? If you can answer that, then who would you be right now--when that same structure is still so clearly in place? I think about history a lot and how history is inside us. It is very much a part of all my work. We speak the silences that we've been passing on. I wanted to take it head on and make that the subject of this novel in a very real, relatable way. And to be cognizant of that history happening each day, each moment. And to be aware of who we are as it is happening because it influences everything we do, our actions, our beliefs, the need to know and understand one's history in order to understand the present. I feel like it is a constant struggle not to look away. Clearly, there's a lot to unpack in this novel. Who was your favorite character to write? Oh, what a great question! I have no idea! This was such a diffuse novel to write, with moments of intense concentration on each character, so I would say each one was my favorite as I was writing them. I loved Reg. Reg seems to be a modern-day James Baldwin, who you reference several times in The Guest Book. Can you talk about the significance of Baldwin in relation to the themes you are trying to convey to readers? The idea that history is trapped in us, as Baldwin wrote, has fueled and inspired me through everything I've ever written. I knew that this novel was going to take that idea literally. What does that mean to have history trapped in us? What does that mean for the conversation about race in this country? To understand that, I read and re-read all of Baldwin and immersed myself in his work. He was so ahead of his time, especially in his fiction. Through Baldwin, I got a greater sense of Reg's character. I wanted to have Baldwin's voice present by him being someone Reg knows. Another concept that intrigued me was the idea of "the anchoress," which is Evie's academic area of interest and relates to a woman in the 1300s who was literally bricked up in an abbey. I see this as a symbol for women's silences throughout history but also as someone who anchors a family, or carries on that history. You know, that is so wild--I never thought of the anchoress as a female anchor of a family! But you've just connected that so perfectly. I see my characters Kitty and Evie in that role. Joan, too. It was meant to convey how women exist inside of institutions and the family is certainly one. An anchor is something that can sink you. With the Milton women, what has the potential to sink them is their own truth. In their own way, Kitty, Joan and Evie construct walls to hide aspects of their history and who they really are. How long did it take you to write The Guest Book? I don't seem to be able to write a novel that happens chronologically. They all seem to move horizontally. What I really want to do is move back and forth through time--stories that walk the same path, people coming in and out of the same room, history as echoing and foretelling. That's very hard to do and takes a long time. That theme of history being both echoing and foretelling is very clear in your novel and something that resonated deeply with me, especially with the character of Elsa. I saw her as almost a harbinger from the past, a character who has a message for us today in terms of "the other." At one point she says, "It's a mistake to think the news happens to someone else, the news happens to you."